The remnant of supernova 1987A shows no sign of the neutron star scientists believe is lurking at its heart. The Hubble Space Telescope took this image in December 2004. A search for the remains of a nearby stellar explosion has come up empty. 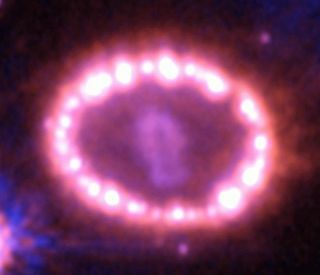 Astronomers observed the blast site of the supernova, SN 1987A, with the Hubble Space Telescope, but could not find any sign of the dense stellar core. "We think a neutron star was formed. The question is: Why don't we see it?" astronomer Genevieve Graves of UC Santa Cruz said today. A neutron star is an extremely dense ball of subatomic particles, which theory says can form as the core of a massive star collapses after exploding. This is what is believed to have happened in 1987, when a star with 20 times the mass of our Sun blew up, 165,000 light-years away in the Large Magellanic Cloud. "Therein lies the mystery -- where is that missing neutron star?" said Robert Kirshner of the Harvard-Smithsonian Center for Astrophysics (CfA). Neutron stars are often detected as pulsars when they emit intense beams of radio waves, like a lighthouse. It may be too soon to see radio flashes from the remnant of SN 1987A, since theory predicts that pulsars take between 100 to 100,000 years to develop after a supernova. A young neutron star could, however, be seen if it is swallowing up nearby gas and debris from the explosion. This accreted material would heat up and emit light. But when the team of astronomers scoured the area of SN 1987A, they found no signature of this accretion. "A neutron star could just be sitting there inside SN 1987A, not accreting matter and not emitting enough light for us to see," said Peter Challis from the CfA. Future observations may uncover this quiet remnant by studying the infrared emission from dust clouds in the vicinity, which may be reprocessing the weak ultraviolet and visible light coming from the neutron star. A supernova from a more massive star can form a black hole, instead of a neutron star. The progenitor of SN 1987A is right near the dividing line, so it may have created a black hole. Still, a black hole would be indirectly detectable by the same accretion mechanism that was not seen in these latest results.